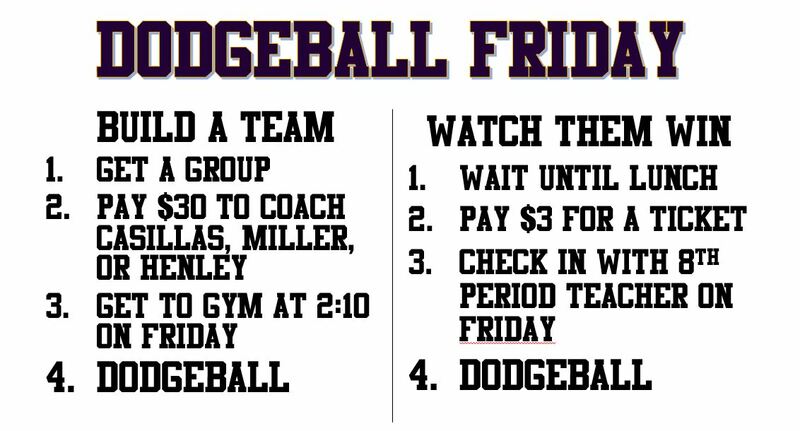 Timber Creek High School baseball teams are holding a dodgeball tournament this Friday, Nov. 14. Students that want to participate will need to find a group and sign up with Coach Casillas, Miller, or Henley. Student teams will need to pay $30 per team between Nov. 5-13 to participate. Teams that use t-shirts or other clothing as a uniform must follow dress code. Students who are playing will be dismissed at 2:10 p.m. on Friday so that they can be ready at the beginning of 8th period. Students that want to watch the tournament can begin buying tickets on Nov. 11-14 during the last 10 minutes of lunch. Cost is $3 per student. Students with tickets should be dismissed as soon as teachers take roll during 8th period Friday. Teams will begin playing as soon as possible, so the tournament may have already begun as students arrive. The school will be in regular schedule and students who do not have tickets or who are not participating will remain in their 8th and 9th period classes. One other thing…there may be a teacher team.